not to mention deity’s long holiday from humanity. I believe totally justified given the big kahuna’s gone AWOL. or a Silicon Valley entrepreneur with a P.S.A. trending on YouTube®. Could even be a teen queen streaming country hits on Spotify®. You get the picture. There’s a million possibilities out there. That said, I won’t go out of my way for any “B-list” imitators. hawking Spanx® and wrinkle creams on QVC®, et cetera. we humans all want to re-create the world!). But I digress. could be the Champs-Élysées or a squalorous alley in old Bombay. waiting to be idolized. And man, do the pilgrims prostrate! Everyone is agog at my god. Everyone but me, that is. dispense with that holier-than-thou crap and get down to business. “Pardon me, god-almighty,” I say, striking up conversation. really see each other for a change?” That’s how I put it to god. And then, I just stand there waiting, holding god’s eye, so to speak. The whole thing takes thirty secs, max. Not much to ask, IMHO. I conclude the meeting with a single word: “Beautiful,” I say. Very simple. Some might say elegant. Just ‘Beautiful’. “I was just about to say the same,” my god replies. Words to that effect. that the gods rarely recognize their creators. 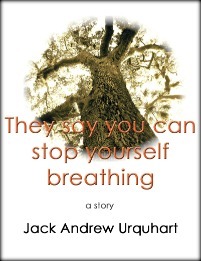 This entry was posted in Uncategorized and tagged Every Man Jack, god fantasy, God in Man's image, god substitutes, Jack A. Urquhart, Jack Andrew Urquhart, modern gods, personal God, Prose poem, Prose Poetry. Bookmark the permalink. I’m perfectly happy with a big termite Goddess up in the sky, looking down on us through a gazing globe (a reference to v.2 of The Termite Queen)! Someday I must get daring and write that satirical send-up of the Old Testament. Hope I live long enough!